What's eating these endangered orchids? A species of seed-feeding fly is critically damaging the seed production of multiple orchid species, as revealed by a group of Japanese researchers. If the damage caused by this fly is occurring long-term and across Japan, these already-endangered orchid species could become unable to reproduce using seeds, and their dwindling numbers will take a large hit. These survey was carried out by Project Associate Professor Kenji Suetsugu (Kobe University Graduate School of Science), Shigeki Fukushima (Head of the Chiba Prefectural Agriculture and Forestry Research Center) and Masahiro Sueyoshi (Principal Investigator at the Forestry and Forest Products Research Institute). The findings were published on September 21st in the online edition of Ecology. With over 20,000 species classified, orchids are one of the most diverse groups of flowering plants, and the unique shape of their flowers has entranced people for many years. Unfortunately this popularity has led to orchid overharvesting. Combined with loss of habitat caused by development, this means that over 70% of Japan's native orchid species are classified as endangered by the Ministry of the Environment. From the perspective of genetic diversity, it is better for endangered species to reproduce via seeds rather than cloning. This means that to save these orchids, we should identify the insects that pollinate these plants and the parasites that prevent seed-based reproduction. Therefore, Professor Suetsugu's research team has been collecting information on organisms related to orchid reproduction. 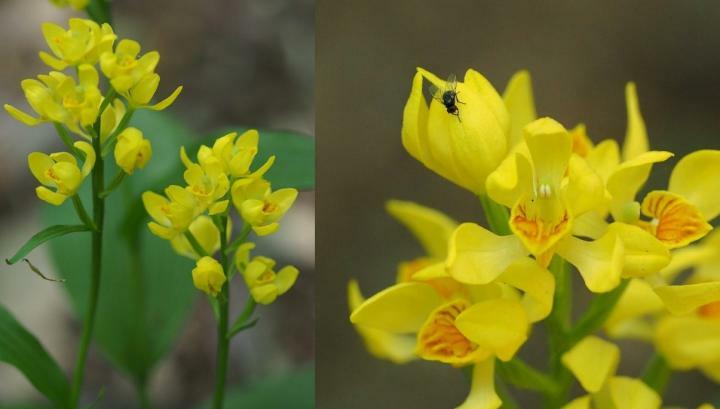 During a survey to identify the pollinators of orchid species, the team found that in pollinated fruit which should be able to produce seeds under normal circumstances, a seed-feeding fly known as Japanagromyza tokunagai was destroying the seeds of multiple orchid species (see figure 1). When orchids bloom, J. tokunagai lays its eggs in the young fruit, and the insect young grow up eating the seeds in the fruit. They become pupae inside the fruit, and when they hatch into their winged forms they make a hole in the fruit in order to make their exit. Fruit that is parasitized by these flies grows to the same size as normal fruit, so at a glance it looks healthy. This means that we have probably underestimated the damage caused by these flies. In many cases, fruit parasitized by the flies produces no seeds at all (see figure 2). Humans have known about the damage caused by seed-feeding flies since the 1980s, but we do not know the impact on seed production in concrete terms. In this study, after artificially pollinating five species of orchids in Japan's Kanto region, the team covered some specimens with bags to prevent the J. tokunagai from entering, and left others uncovered. Afterwards they compared the quality and amount of the seeds produced by each plant. This is the first study to precisely quantify the reduction to orchid seed production caused by J. tokunagai. Results showed that in all five species, damage caused by J. tokunagai reduced seed production by over 95%. It is not yet clear whether this is occurring across Japan or over an extended time period. However, if this situation continues, the affected orchid species will become unable to reproduce via seed production, threatening their already dwindling numbers. It is also possible that damage caused by J. tokunagai may be intensifying in recent years. This could be for two reasons: firstly, the flies are non-native species that have been introduced into areas where they lack natural enemies, and secondly, because the orchid populations have become fragmented, also reducing the population size of natural enemies. Professor Suetsugu comments, "Going forward, we want to shed more light on the damage caused by J. tokunagai. We plan to do this by quantifying the damage in other areas of Japan, and by testing the theory that J. tokunagai is a non-native species through genetic analysis".